Why should you visit the Mexican Caribbean in winter? Cancun is perfect for any occasion. Although it is reputed to be one of the favorite destinations for spring breakers and adventurous travelers, it is also a place for those who seek a break from everyday life –during any season- in an exclusive environment. Here you can discover a great variety of tropical sea species. The Interactive Aquarium of Cancun is a good place to get to know them, but there are also diving tours so you can swim with them. Some of the best culinary chefs in the world are in Cancun. And during this season, you can try special edition Christmas dishes for a limited time. While in the rest of North America it is very cold, even in winter it is hot in Cancun. In addition, we have a variety of Christmas activities that will warm your heart too. Cancun is one of the most developed luxury destinations in Mexico. Playa Mujeres in Winter, for example, gets painted in winter colors and is a destination that you will want to visit if you are looking for quiet and exclusive activities. Between the bamboo bars, the cocktail bars in the city and the resorts with nightclubs, the party does not stop. If it's your first winter in Cancun, we give you some tips so that no detail is missed. Flying mid-week will generally save you money. When you consult the fares, do not forget to contemplate taxes and other costs involved, such as baggage charges. Check the departure and arrival times and do not spend your entire budget at the hotel. Cancun offers an immense variety of places for all budgets. A good resort in Cancun will always have a spacious room, jacuzzi, private balcony, minibar, access to the pool, etc. In addition, most of the resorts have restaurants, spas, gyms, swimming pool, water sports and access to the beach. Search for reviews of the places you would like to be and compare the comforts among them so that you find the right one. If you do not come with children, we recommend all-inclusive resorts designed for adults. To make your holidays exceptional, you can add a visit to Xcaret, an ecological park with stories and adventures in the middle of nature. The entrance to Xcaret includes the Children's World, the Scenic Tower, the Main Square, the House of Murmurs, the Hacienda Henequenera, the Mexican Cemetery, the Archaeological Zones, the Mayan Village, the River of Paradise and the Cava 'Vino de Mexico ', among other attractions. You can pay an extra cost to have access to activities such as Dolphin Ride, the Adrenaline ride, Sea Trek and Snorkel Tour, among others. If you are going to be more than a week, we recommend buying packages with two or more parks that are part of the 'Xcaret Experiences', such as Xplor or Xenses. If you like to immerse yourself in history during the holidays, and depending on your location, we recommend exploring some of the Mayan ruins such as Tulum or Cobá. The ruins of Tulum are seated on a cliff facing the ocean. In addition to vestiges of antiquity, you can coexist with the local fauna. The ruins of Cobá are surrounded by cenotes and, because they are less visited than the others, you can calmly enjoy their beauty. To make the most of this activity, you can book tours from some hotels direct to the ruins, with guides that tell you all about these millenary places. At the end of the visits you will have learned something and, in addition, you will have made excellent shots for your Instagram profile. Regardless if your trip only lasts a few days, there is always time to go shopping, either in malls or in markets, where you will find both local brand and local tax-free items. Contemplate and stick to your budget so that you do not exceed the taxes for excess baggage. Finally, we recommend you distribute your travel expenses well. Although there are activities for all budgets and you can even get to enjoy being alone in the hotel, we do not want you to miss anyting that Cancun has to offer in any season of the year. 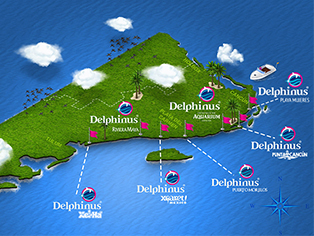 At Delphinus we want you to enjoy your December holidays and have a happy holiday. Swim with dolphins in any of our habitats and make the intention to return next year to new adventures.